First off, the basics. You should check your engine’s oil level every couple of weeks. For this you use the dipstick in the engine – which should be brightly coloured and easy to spot, though consult the car’s handbook if you’re not sure where anything is. Also make sure to check the oil levels when the car is on a level surface to get an accurate reading. Take the dipstick out from the engine, wipe it clean, then dip it back in the tube and out again to see what level the oil marks it up to – it should be between the two marks at the end of the dipstick – ideally near the top mark. If it’s not then top the oil up via the oil filler using a funnel. After giving time to let the oil run through the engine check the oil level again via the same process, being careful not to overfill which can cause leaks. You can buy oil from specialist car shops though remember to check therein whether the oil’s suitable for your car. The shop should be able to advise on this so long as you have the car’s registration number! Online look-up tools also exist. Michael Barera [CC BY-SA 4.0 (https://creativecommons. Coolant and antifreeze keeps your engine operating at the right temperature as well as has other benefits like reducing corrosion. Check on a weekly basis that your engine’s coolant/antifreeze level is between the ‘MIN’ and ‘MAX’ marks. The cooling tank should be clearly visible when you open up the bonnet, it usually is a clear tank (so you’ll see the coolant level) with a cap on top – again check your vehicle handbook if you want confirmation where it is. Coolant and antifreeze can be bought as a combined fluid – it can come in a concentrated form that needs to be diluted but often it’s available as ready-mixed. Again when you buy your coolant make sure it’s suitable for your car via the same process outlined above for oil. By law your screen wash system must work so top that up regularly too. Use a good quality screen wash additive that clears oily grime and prevents it from freezing. The tube via which to pour in the screen wash will also likely be under the bonnet – again consult your car’s handbook for its whereabouts. Check as well the temperature range that the antifreeze covers – the bottle may also have instructions of how to dilute the screen wash to work in a narrower temperature range. Keeping your tyres in good shape has various benefits, not only safety aspects like avoiding blowouts and improving stopping distances, but also aiding road holding, fuel economy and tyre wear. The AA recommends you check your tyres every couple of weeks. The car will likely have a manufacturer's sticker inside a door or the fuel flap showing the correct tyre pressures for your car for various loads – failing this the car’s manual should have this information. Do the checks when the tyres are cold, i.e. not straight after a journey, as the heat will affect the pressures. Attach a tyre pressure gauge to the tyre valve to measure the pressure – gauges are widely available online and in specialist shops; you can also get devices that inflate and deflate the tyres as well as gauge the pressure, some are automatic electronic systems when you enter the desired pressure figure in and it does the rest. Additionally a lot of garages and petrol stations have pressure gauges/air pumps and often are free to use. 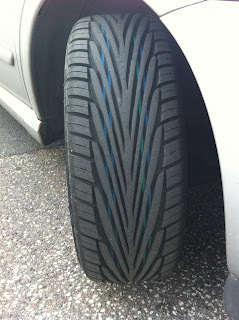 Check for both over and under inflation which both can damage the tyre. Some cars have a tyre pressure monitor too, which may alert you via the dashboard of pressure out of range – so check your car’s user handbook for this. Also check for bulges, nicks and cuts on the tyre, including the sidewalls, using your hands. Tyre tread depth has to be above 1.6mm to be legal in the UK, which must be the case for the middle three quarters of the tyre. An easy way to check the tread is using a 20p piece, the outer border of which is roughly 1.6mm – so stick a 20p into the tread grooves and check that the border cannot be seen. Alternatively specialist tyre tread depth gauges can be purchased. You also can look for the tread wear indicators, which are small raised areas at the bottom of the grooves – once the surface of the tread rubber is level with these raised areas again the tyre needs replacing. Even so, many tyre and safety experts recommend that the 1.6mm level is sailing too close to the wind and tyres with tread depth of 3mm or lower should be replaced. You also can buy cheaper tyres in Stirling from Fife Stirling Autocentre. Wheel alignment – or tracking – is also an important part of car maintenance, as wheels can literally get out of line, due perhaps to hitting kerbs or potholes. The effect is fairly obvious, such as that it can affect road holding, increase fuel consumption and decrease the life of your tyres. Tell-tale signs of misalignment can include the car dragging or pulling to the side, uneven tyre wear such as premature wear on the inside or outside shoulder, and steering wheel vibration. Garages can adjust the angles of the wheels back to the recommended position. The MOT date is just about the most important date to remember when running a car. The MOT test checks that your vehicle meets road safety and environmental standards, and you book it with an approved MOT test centre – these have a blue sign with three white triangles. There also are maximum fees that the MOT centre can charge. You must get an MOT for your vehicle by either the third anniversary of its registration or the anniversary of its last MOT if it’s over three years old (though some vehicles need to be tested at one year old – such as ambulances, taxis and minibuses). An MOT once passed lasts for a year and the date it runs out is printed on the last pass certificate. The date for your next MOT can be checked on the gov.uk website and you even can get them to send you a reminder email or text for a month before your MOT is due just by entering your registration number and contact details. You cannot – with only certain exceptions – drive your vehicle on the road if the MOT has run out, and you can be prosecuted if caught. Note that different MOT rules apply in Northern Ireland. Your battery is important – not only to power the car’s electrical system but more importantly it gets the car started. 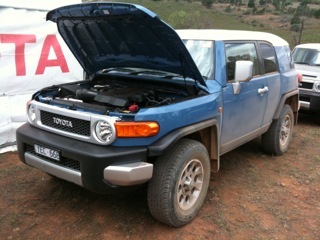 Moreover a flat or faulty battery is the most likely cause of breakdowns. Smart Ways to handle a Car Breakdown in the Middle of Nowhere. As well as the car not starting the lights dimming may be a tell-tale sign of battery problems. The one most commonly cited cause of battery problems is forgetting to switch your headlights off after finishing your journey, so make sure you remember! But there’s other things that can contribute like excessive strain from running lots of electrical equipment like iPods and sat navs, cold weather, or even corrosion or loose connections. You can also check under the bonnet that the clamps are properly connected to the battery terminals as well as for battery corrosion – often it is in the form of a salty crust around the exposed metal on top of the battery and the wiring that connects to it – and there are ways and means of cleaning a car battery but make sure you know what you’re doing given the obvious safety risk. Same goes for jump starting. If your battery is badly corroded it'll probably need replacing. Then again given it’s a battery it has a finite life – somewhere between three and seven years – so a problem may simply mean that your battery is reaching the end of its time. If a battery does need replacing its best done by a specialist garage as plenty can go wrong! Thank you for such a useful information! I like the articles like yours, because all is interesting and simple! My friend advised me to read this https://www.faxvin.com/license-plate-lookup . Did you know that you can find out the accident history of your car from license plate? I would like to bookmark the page so i can come here again to read you, as you have done a wonderful job. Really its great car maintenance tips. 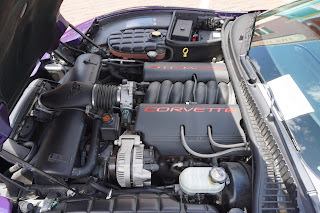 If anyone is looking forward for general car maintenance tips online, Stuck In Drive is right choice.